Who of us isn’t guilty of spending more time bingeing TV shows than reading, cleaning the house, or getting any real work done? Don’t worry. It’s nights like tonight that your expertise shines because tonight we got to find out who won Favorite TV Show at the People’s Choice Awards, and chances are, you’ve already seen the winner. Among the nominees were the Big Bang Theory, Grey’s Anatomy, The Walking Dead, and Stranger Things. But in the end, none of these could hold a candle to the winner for the evening: Outlander. Yeah, that’s right. This time-traveling romantic drama is beating out doctors, zombies, monsters, and nerds. Booyah! Outlander is about to start its third season, and if its first season wasn’t enough to convince folks of its chops, the second season sure converted the non-believers. 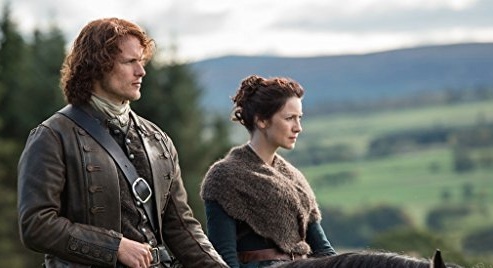 Seriously, Outlander has got everything you could possibly need in a TV show: a talented and physically gifted cast, a strong leading lady who needs no rescuing, really (and we mean really) steamy love scenes, war, and history (well, sort of). Basically, there’s something for everyone and quite frankly, we love it. If you haven’t already started watching Outlander, you should probably start. There’s a good chance this becomes another show that develops a wicked following a la Breaking Bad, Mad Men, and the like. And who wants to wade through spoilers while trying to catch up?